The father of a child who was abused by a honorary policeman in Jersey has called on the island's most senior official to resign. Attorney General Sir Philip Bailhache, allowed Roger Holland to remain in the service, despite a 1986 conviction for indecent assault against a young girl. Holland, 42, who went on to assault three girls while a serving officer, was jailed last week for two years. 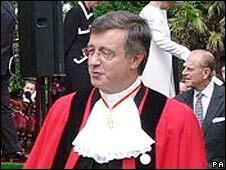 Sir Philip, now Jersey's Bailiff, said his decision was made in good faith. That decision was not to refer Holland's appointment back to Jersey's Royal Court. But, he added in a statement, with hindsight it was possible to say a different decision ought to have been made. Holland admitted assaults on eight girls over a 19-year period at Jersey Royal Court. He was aged between 15 and 34 when these were carried out. The father of one of the abuse victims told BBC News: "My personal opinion is that Bailhache should have resigned years ago. "The man made a fundamental mistake that led to a child being abused and he has no right to be in the job." Jersey has 12 honorary police forces, one for each of the island's parishes. Officers are unsalaried, but can work with the island's States police. In 1992, despite stating on his application form that he had been convicted of an indecent assault against a young girl in 1986, he was elected as a constables officer and sworn in. The Jerseyman was later promoted to the rank of vingtenier, the second most senior in the island's volunteer force. Mitch Couriard, from the Jersey Honorary Police Association, said lessons had been learned and the vetting process tightened up. BBC Radio 4's The Investigation will be broadcasting more on this story at 2000 BST.